in conversation with Dr. Ken Little. Co-sponsored by the Health & Society Program, International Development Studies Program, Department of Anthropology and CERLAC. hosted by African Studies' John Saul Seminar, Faculty of Environmental Studies (FES), and the Graduate and Undergraduate programs in Development Studies (IDS/DVST). 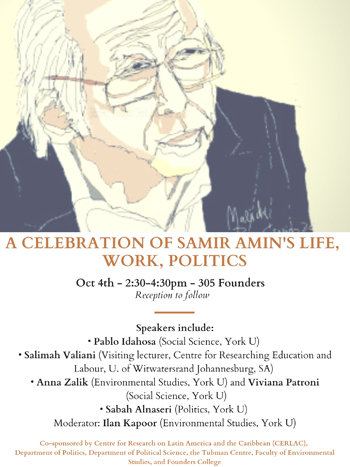 "Samir Amin: Scholar, intellectual, activist"
"Unequal Exchange and the capitalist world economy"
"Intellectual production and the circulation of ideas in the Global South"
"Alternative to capitalism: delinking and South–South cooperation"
In celebration of its 10th anniversary, the Graduate Program in Development Studies invites you to When They Awake, a film by Pedro Marcelino and Hermon Fahari. 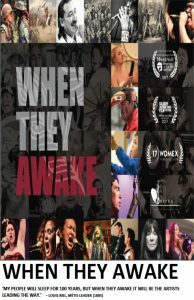 When They Awake documents a remarkable generation of established and emerging indigenous musicians in a moment of cultural and political resurgence. In this era of native resurgence, from Idle No More to Standing Rock, indigenous musicians across North America are making their voices heard… and people are starting to listen. Working in every genre from Hip Hop to Rock to EDM and beyond, a generation of native musicians are channeling the pain of the past into a stirring, hopeful vision of the future. It is this generation and their astonishing music that When They Awake bears witness. Featuring more than 20 artists, including modern trailblazers A Tribe Called Red, Tanya Tagaq, Leela Gilday and Iskwé, When They Awake is a magnum opus documenting contemporary indigenous musicians as they transform historical trauma into compelling art. Film & panel discussion: Miguel Gonzalez, moderator (International Development Studies), Bonita Lawrence (Equity Studies), Pedro Marcelino (co–director), and Brian Wright–McLeod (music journalist & author of The Encyclopedia of Native Music). Film and panel discussion: Wednesday, January 24th, ! :00–3:45pm, Nat Taylor Cinema, N102 Ross. 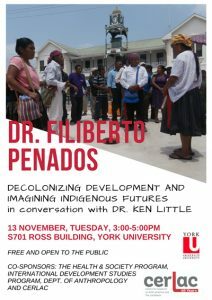 Co–sponsored by the Faculty of Liberal Arts and Professional Studies, and the departments of Equity Studies and Social Science and Founders College.